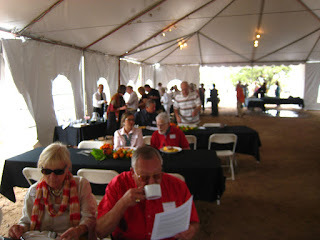 A short while ago we were invited to an early Sunday brunch in a tent in front of The Wheelwright Museum in Santa Fe. The Wheelwright is a private institution that was founded in 1937 by Mary Cabot Wheelwright, who came from a wealthy Boston family, together with Hastiin Klah, a Navajo Medicine Man and artist who she had been introduced to on the Navajo Reservation. Both were interested in the preservation of the Navajo culture and religion and they became fast friends. In 1990 the museum was officially listed on the National Register of Historic Places. As you might expect, the museum was originally devoted to the art of the Navajo and the building that was constructed was in the form of a traditional Navajo home, a round building known as a Hogan. The original exhibition space was 1,500 square feet which today has a few additional spaces. In the Hogan a myriad of different kinds of exhibitions have been done including Pueblo Indian Embroidery, the Native American Curio Trade, and Thunderbird Jewelry from the Santa Domingo Pueblo. For us the shows there are among the best anywhere because they are totally focused on a limited theme and masterfully installed in a way that the material is clear and easy to understand. 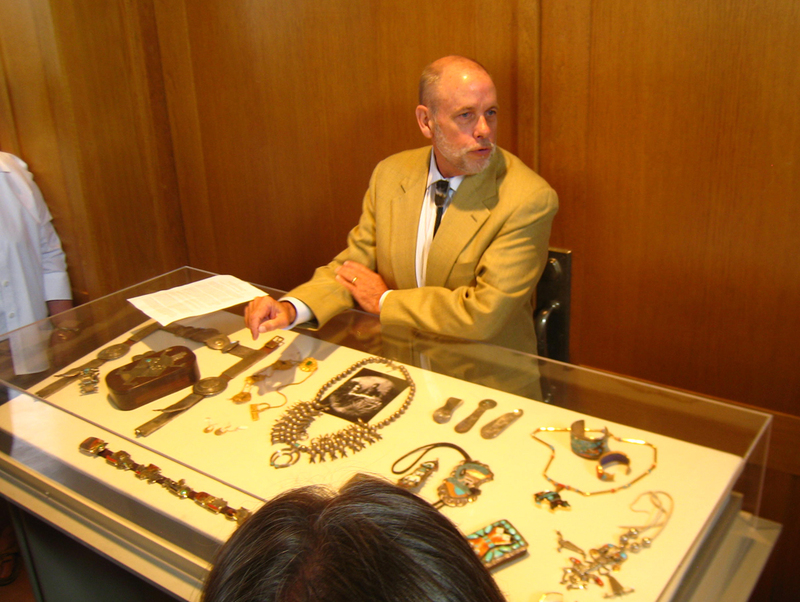 The brunch was a follow-up to a similar event five years ago where it was announced that a couple from North Carolina, after having researched museums across the county, had decided to donate their historic Navajo Jewelry Collection to the Wheelwright. Many are happy to donate collections to museums but, in this case, as importantly, they would contribute enough money to kick off a campaign to build an extension to house the museum’s jewelry collection. 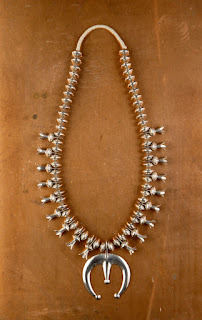 This fed perfectly into a concept that the director, Jonathan Batkin, who came to the museum in 1990 and his curator, Cheri Falkenstien-Doyle who arrived in 1998 had since the beginning of the millennium, to create an additional space in which to exhibit jewelry and study its derivation and history. The $3,000,000 fund raising campaign, which was begun five years ago has been 75% realized. The proposed 7,000 square foot extension will have a 2,000 square foot gallery with a space for a semi-permanent exhibition of the history of Southwestern jewelry as well as a space for a regularly changing exhibition. 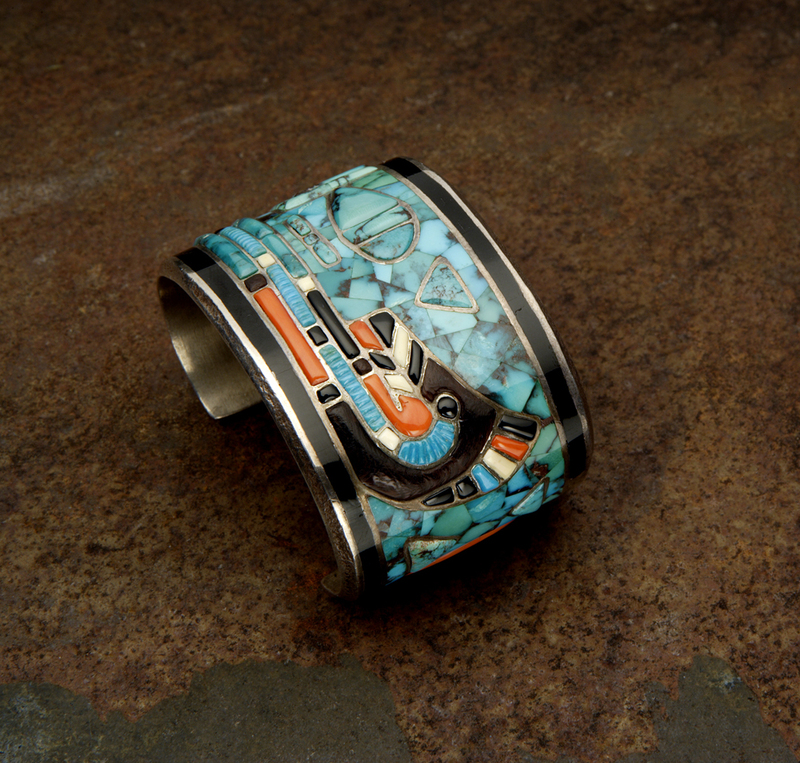 It will be known as the Center for the Study of Southwestern Jewelry and named after Martha Hopkins Struever, a dealer in Santa Fe who is an expert on the Southwest and its Indian art. By the way, she has some of the best jewelry around. She hustled to help make this project a worthwhile realization. Her greatest contribution was to bring in the donations of several additional collections. Together with what the museum already has, the Center will have nearly 5,000 pieces. Most intelligently, they have not only collected jewelry, but also the papers of scholars of Southwest jewelry including Washington Matthews (1843-1905) who wrote one of the earliest books on the subject published by the Smithsonian in 1883, and John Adair the leading 20th century scholar of Navajo jewelry. All will be part of the center. Until now the concentration has been on the Navajo, but this is where the collections that Martie Struever has brought in have played a major role. She has obtained a major collection of Zuni material and other tribes, but, alas, the overlay silver that the neighboring Hopi created after World War II is still lacking. 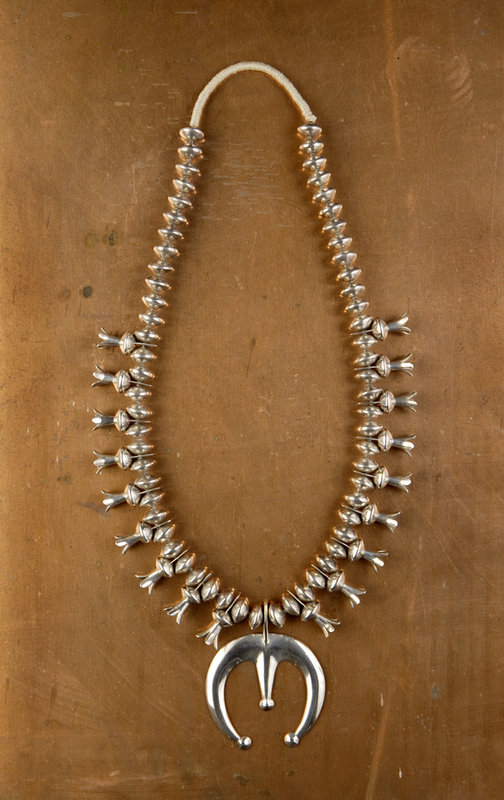 A former president of the Board pointed to a wonderful overlay silver bola that Penelope was wearing by a recently deceased Hopi silversmith and said, “That is the kind of object we have not yet been able to find…” One always hopes that what one collects is museum-worthy but the pieces give us such pleasure we cannot bring ourselves to part with them, yet. probably 1950s. Photo by Addison Doty. To learn more about Jonathan Batkin’s concept for the Study Center watch the director speak about a few of the pieces in the collection and their historical documentation.